In addition to the pucker of the century, the needle was laboring to get through the layers of fabric, underlay and stitching that is very close and dense. 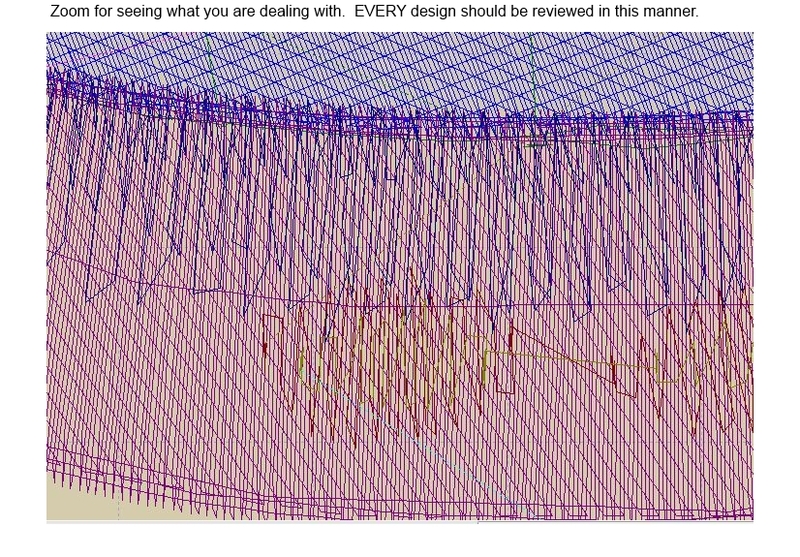 This is often the bane of designs that are truly detailed. Those details and the way the threads lay to catch the light are a major contributor to the heavy stitching. 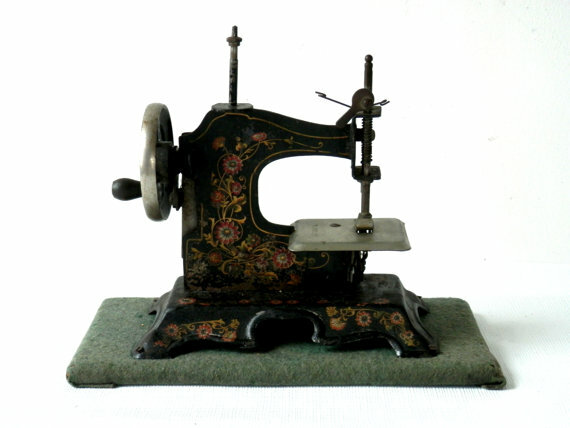 I personally had a machine similar to this one as a child. It know that it worked and regret that I don't still have it. Collectibles are not for the money - at least for me - they are for the joy and beauty of something of a by gone era. But, getting back to Cast Iron embroidery. If you have done your 'due diligence' for embroidery, aka sewout or discovery sew, you will know that you may need to change the density of the stitching. One thing that you need to keep in mind is that the design may well have VARYING DENSITY all through it. One area may sew easily and another area will be pounding and possibly broken threads or needles. Let me show you what I mean. I know this design is too dense in several areas. 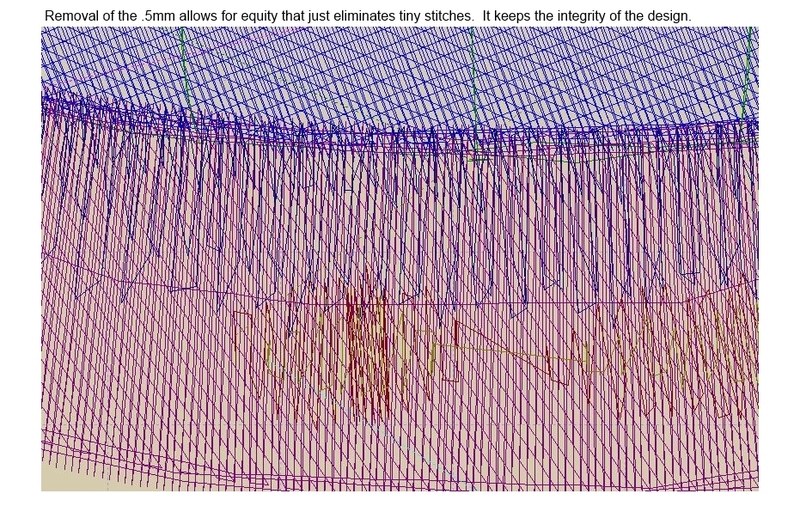 Each picture is just an enlargement of the stitches. The first photo has about 25,400 stitches. 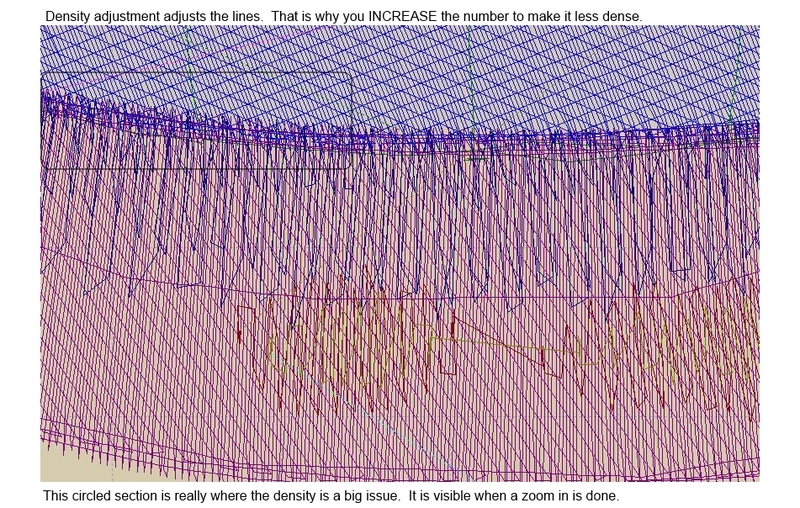 The second photo is density reduction from 4.0 to 4.5 and has 24,300 stitches. The third photo is what is known as (in my software) 'tidy up small stitches' and I have removed each stitch that is less than .5mm* which I personally consider to be a 'hole.' (This is one of the main reasons why I use the metric system when embroidering. Things are so much easier to change when you are working with 1's 10's and 100's). So, the third photo is the original 25,400 stitches and deleting the .5mm stitching, it comes to 24,000 stitches. These items are hard to see so I have made them larger than normal. I tried to make them the areas the same so you could see the adjustments and their affect. I do promise, the photos are different. The third idea I have for adjustment of this issue is to use a lighter weight thread. I have 60 weight available. It will make a very nice difference but could be too lean in some areas. Density - what a thick problem. . . . Some of the more sophisticated programs may be able to let you select a color and then adjust. I really don't know all the programs available. Perhaps finding another suitable design may be an answer as well. Incidentally, some sites indicate that they DO NOT use more than a single sheet of stabilizer. I personally have used up to 3 sheets of stabilizer to circumvent the puckering. It worked for me. If you have a method that you use to work with a dense design, I hope you can share it with all of us. Short of doing your own digitizing, I am not sure how to make it right. It was surprising (to me) that using these metric numbers was easier than I originally thought. When I wanted to 'clean' up those stitches that were extremely small, .5mm makes more sense to me than 1/50" does. However, be careful about removing small stitches. You may be removing too many detail points, therefore, be sure to do your 'discovery sew' or 'sewout.' Nothing takes the place of a 'prototype' when working with details!! I did think of another thing to do when you have a bullet proof design - be sure you are using a fresh needle. It is surprising just how hard the machine must work with a dull needle. Needles are the cheapest thing about embroidery. I personally check to see the number of stitches and the date I change my needle. When I started doing this, I was changing at about 150,000 stitches - - - need I say - - - that was way too many??? For my work, I find that about 80 to 100K is good for needle use. It does not have to be DULL before I change them!!! You may find another number that is better for you. So often sites will say "after X hours of embroidery." Frankly, time flies when I am embroidering and that just won't work for me. Additionally, I was told by a dealer in the southern California area that 'Universal needles are just fine for embroidery." For me, I buy embroidery needles. There is something that they do that makes them just a little different. If the embroiderer does not have an editing program that allows them to change density, a slight enlargement of the design can help reduce the bullet-proof stitch-out. This may be done on the machine without increasing the stitch count. Software that does not allow the user to change density, but does allow enlargement will usually also increase the number of stitches and the bullet-proof results would remain. Short version: Machine embroidery specific needles have a longer, larger eye and a deeper scarf on the front of the needle to guide the thread that is moving at a rapid speed. This needle also has a rounded point to help protect the thread from shredding and breaking. I also believe keeping track of the stitch count does work better in determining when to change the needle as machines can be run at different speeds. Slow speed takes longer, but the number of stitches made by the needle would be the same as running the machine at medium or high speed for the same design. Test (including stabilizer) before starting the project to see what will work best. This may sound like a waste of time and supplies, but not so much if you ruin your project. If you don't have time for the TEST design, what are you going to do when your project does not meet your expectations, especially where the correct supplies and options would have saved you???????????? What’s in a name? AlphaTricks Tricks!